This post will be targeted at my male readers (though I have been told by female friends that the same applies to females too). Note that this applies whether you are looking for a suit for work, an evening suit or a formal dinner suit / tuxedo. Historically I had normally bought a mid-range (i.e. $300 - $400) suit off the rack direct from the importers which saved me a lot of money compared to if I had bought it in store. The suit quality was decent but not outstanding and I would normally need to get it altered to fit me. I had always thought that getting a tailor made suit was a silly extravagance and could not really understand why people did it. However when I went to Thailand for the first time on holiday I thought I would get one made to see what all the fuss was about. I was totally converted. You notice the difference once you are wearing a suit that is made for you. It is neither too lose nor too tight, too short or too long and if you have never worn one before you notice the difference immediately. In countries such as Australia, the cost of getting a suit tailored are unbelievably expensive. Getting a tailored suit made of ordinary material will cost up a minimum of $1200 and this is typically with a single trouser only. Further even at this price you are paying for a pretty ordinary tailor. For a decent suit with double trousers from a good tailor you're probably paying closer to $3000. Flying to Asia only to get your suits made may seem a little extreme but when you go through the maths and the see the quality of the finished product you will see that it works out really well. I get my suits made in Thailand at Raja's Fashions which was recommended to be by the CEO of a client I was working for at the time (standard comment re my recommendations: I get no kickback from these guys). They are actually very expensive by Thai standards. However the upside is that you can be assured of the quality and the materials they use are outstanding. Note that this valuation will continue to change as new pieces of information become available. As companies report their results, or corporate actions or as your the investment and regulatory and business environment changes around them the valuation of the company will change. Likewise you should keep changing what you think the target price is worth to take into account all information that you think is relevant. What will happen in many cases, is that when you have picked the right investment the market will eventually see what you saw earlier and the price will go up as a result. Sometimes the market sees more than you do or perhaps becomes over-enamoured with a stock or thinks that it is a potential as a buy-out candidate and the price will run well past what you think it should sell at. And trust me when I say this - this is one of the hardest things to do. Your investment bet has come off and you have the gain you envisaged when you made the investment (sometimes a lot more as the stock price has run well past this point) but you do not want to sell because there is something inside all of us that says - "but what if the price continues to rise?". The FEAR of missing out totally outweighs our rational mind that says what we should do is take our gain and be happy that we made the right investment decision. We are also misled by statements taken out of context such as Warren Buffett's oft quoted saying that "We intend to hold our stocks forever". While this should be true if the stocks never reach the valuation potential, Warren Buffett also often talks about Mr Market, and the fact that Mr Market is irrational and offers you great deals from time to time. The necessary counter side to Mr Market is that he offers you great deals for the stock you already own (i.e. the market is paying too much). This is when you should sell the expensive stock and go look for opportunities to buy cheap stocks. I have done a post on this before. The argument I raised at the time was that if you are the least informed person in the market then the risk is that you sell too soon to others who have more information. However if you have no more information than the market and the stock has done exactly what you expect it to and more then holding onto it is essentially a gamble that the rumours are true. This is a problem I have been facing more and more recently. As a lot of my investments are paying off I find myself sitting on bigger piles of cash as I have not found more homes for this cash. Although these are all valid considerations however if you have done your research, are up to date on what is going on with your investment and you still think the market is pricing it too high then you should sell and be happy with your gains. If you can - avoid seeing what happens next. It may be that the stock goes up a lot more. But you have made the gain you set out to and that should be your only consideration. Throughout the world, homeowners would have noticed the phenomenon that while the 'official interest rate' has been dropping dramatically (in the case of the US it has gone to virtually zero), home mortgage rates have not dropped as much. I'm not sure about the rest of the world, but in Australia where banks are still making record profits and where they have not had the bad debt issues seen in the rest of the world, every time there is a rate decrease of 0.25% and banks decrease their rates by something like 0.20% (i.e. do not pass on the full official rate cut) there is uproar - particularly among the politicians and the media. Some basic finance first - how does the official interest rate work? Reserve banks in different countries operate differently, however they fundamentally do the same thing. They control one interest rate (typically a very short term one) and this interest rate influences all the other interest rates in the market. The following description is from the Australian perspective. Effectively what the RBA (Reserve Bank of Australia) does is control the overnight cash rate. They do this by controlling the supply of funds available to banks in this overnight market (i.e. more funds mean a lower interest rate and vice versa). A more in depth discussion of this is available at the RBA's official website - see link. Because they control this interest rate they influence all the other interest rates in the economy. This is because if this interest rate moved and none of the others didn't there would be an arbitrage opportunity. Because of the constant work of traders at banks and other financial institutions such arbitrages don't exist. So when the RBA decreases their interest rate, the market automatically moves the interest rates on all other interest bearing products. While the banks theoretically could keep their interest rate the same and take the higher profit, what would happen would be that some other bank would try and gain market share and cut their cost. As soon as they do this everyone else has to cut their mortgage costs as well. OK so if official interest rates serve to move all interest rates - why aren't the cuts passed on in full? This essentially comes down to how the banks are funded. If I use the major Australian banks as an example. Most of them are funded through a variety of sources but at the broadest level they have ~60% retail funding and 40% other (mostly wholesale) funding. For Australia, most wholesale funding comes from international markets. Therefore any changes to the official cash rate will only move the cost of funds for ~60% of their funding. 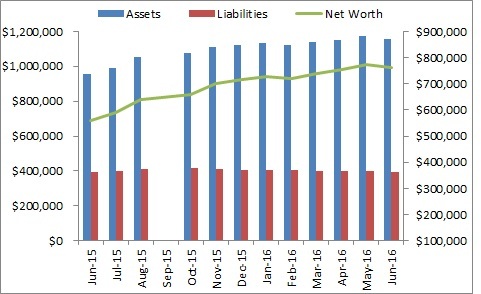 BUT where there is competition for deposits (such as term deposits) and banks are paying higher margins on these term deposits, much of the cost of debt will not get passed on. In Australia over the last few years there have been several factors hitting the funding markets for banks. Wholesale funding costs have been going up, as has the competition for retail deposits. Against this the official cash interest rate has been coming down. The result is that we definitely feel like we should be paying less. 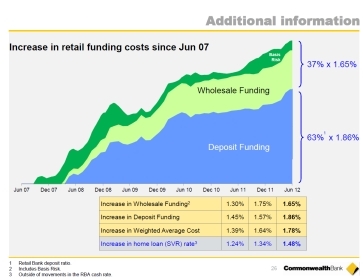 The following diagram was one released by the Commonwealth Bank of Australia in their FY12 Results presentation in August 2012 and gives a great indication of why home loans have repriced in the way that they have (relative to the RBA cash rate) and the things that have been impacting them. But doesn't that mean that when official interest rates are increasing the opposite should be true? In short - yes. However banks use this to recoup a lot of the losses they are forced to wear when interest rates are going down. They also use this opportunity to 'profit gouge' to a large extent. Therefore as consumers you should be more annoyed on the way up not on the way down because that is typically when you are actually getting screwed. As outlined in my previous post, once you have bought your property and leased it out to your tenants there is nothing much you need to do other than keep track of your finances, the required maintenance and your lease. This post will cover the last of those points. Typically properties are leased for either 6 or 12 month periods. Towards the end of this period you need to renew your lease. Many landlords and indeed property managers are quite lazy about this and leave it quite a long time. I confess the first time my lease renewal came up I got onto it straight away but the second time I totally forgot about it (my fault not the property managers). When you renew the lease you typically are able to raise the rent. This is a post that will probably be more useful for the guys than for the girls simply because all the women I talked to already knew what I'm about to type below but for many of the guys it was a genuine realisation. Most of use would have seen the price of perfumes and aftershaves drop dramatically over the last 5 years as chemists started selling high end perfumes for a fraction of their previous retail price. If you go into the department stores you will still find them selling at the high prices but in the chemists they are often 20% - 40% cheaper. The result is that if you have walked past a specialist perfume shop you will notice that most of the time it is empty and if there are people in there it is often a hapless male looking for a perfume for his wife or girlfriend. However not all brands made it into the chemists. Some brands put some of their range into the chemists (presumably to get customers to try them out) and kept selling their higher end products at the premium prices. This was true of my preferred cologne which is Ralph Lauren Polo Black - the chemists only sold the regular Polo aftershave range and I had to resort to paying $120 for a small bottle of it from the airport. This constantly bugged me until I discovered there is a cheap alternative (which doesn't involve you having to travel or line up at duty free stores). Recently I was introduced to StrawberryNET, an online retailer of skincare, makeup, haircare and fragrances. All the women I know have heard of and use this site regularly - if you go to the site you can see why very few men would have ever clicked into it. In a recent post on corporate governance I outlined what ESG is and how it is different from ethical investing. This post will deal with why, even if you do not think of yourself as a particularly 'activitist' or ethically driven investor (i.e. your decision is first about the return that you get) you should build some sort of ESG framework into your decision making process because it really does affect valuations. It is much easier to see how bad performance in ESG considerations affects valuations negatively than how good performance affects it positively. This is because bad performance often results in valuation impacts that you can point at whereas proponents of ESG investment argue that good performance creates or enhances a business over the business life. For this reason I will be focusing below on how bad performance with respect to ESG negatively impacts valuations. For example the tragic oil spill in the Gulf of Mexico was expected to cost BP US$7.7 (see link) and this amount comes straight off the valuation of the company. A few months ago I wrote a review on the Google Nexus 7. I had just received it and was very excited about it but had not had a chance to use it extensively and under 'normal' situations. This, second review will hopefully be more objective as the 'honeymoon' phase is probably over for me and I can me more objective with it. Size: Now that I have had time to use it extensively I have found that size is both a pro and a con. The smaller screen makes it very good as a portable entertainment piece. The last time I did the review I was particularly impressed with the facet that it could fit in my suit pocket. However I invested in a slim case (generic brand) which added enough to the dimensions which means it no longer fits in my inner suit pocket. Price: For the price I still think it beats anything around the same price point in the market and many of the other higher end products. But before you rush out and buy for this reason make sure you think about what you are going to use it for. Quality: I am still very impressed with the build process and Android Jelly Bean still manages to wow me. Since I did the original review I have found other areas that I really like with the tablet. Before you get a portable wi-fi device from your mobile provider - check to see what your mobile data plan is! The Nexus 7 however is amazing! It uses little data and the tracking is amazingly accurate. Google Maps is an absolute dream on it. Overall this device is great as an entertainment device - and I have morphed into use it this way. I carry it with me basically everywhere (I can guarantee you that I would NEVER do this with a device as big as the ipad). For business purposes though it is just too small to be able to type fast enough to be able to get what you want down. The programme crashes do not help either. Last time I said that I typed my blog post on the tablet. I have reverted to once again doing this on my laptop as the 'cool factor' associated with doing it on my tablet wore off very very quickly. Life Insurance: An insurance that pays out in the event that you pass away. In my previous post I mentioned that people who have dependents should definitely have life insurance but singles and those who are financial settled probably do not need it. TPD Insurance: An insurance that pays out in the event that you are so disabled that you are no longer able to work (but does not pay out if you pass away). In my previous post I had mentioned that I thought that EVERYONE should have this type of insurance, whether you have dependents or not. This post will cover income protection insurance and whether you should consider investing in it. Generally speaking income protection insurance is a benefit paid on a monthly basis which pays you a certain percentage of your income (generally 75%) of your income and covers you for accidents, illnesses and major traumas. Unlike TPD insurance it does not require that you not be able to work ever again but rather pays you for the time that you are off work until you return to work. It normally comes with a waiting period. If you cannot return to work it pays you until retirement age (in Australia this is 65). It is designed as an 'interim insurance' rather than a final type of payout that TPD and life insurance payouts tend to be. Income protection insurance is often provided by employers (especially multinationals) and Australia this is normally done through your superannuation package. It is normally bundled with Life and or TPD insurance to provide 'all situations' type cover. If I don't work for a period of time, can I still pay the mortgage, put food on the table and meet all the other necessary expenditures? How long would any savings I have last? How old am I and how long is it likely to cover me for? If you have sufficient savings set aside you probably do not need income protection insurance but you should always ask the second question because you need to consider not only if you could last a few months without your income but if you could last a few years (in case you get really sick but not an event that TPD covers). This is a type of insurance which is also age dependent. Because it only lasts until your retirement age (65), it probably isn't worth getting if you are in your 60s...at this point you are probably pretty close to being set up and if you get really ill it is not going to cover you for very long. Obviously it is dependent for every person but if you are young and not yet set up it is probably something that you should really consider getting. What are the the things I should watch out for in the policy? The waiting period between when you actually claim and when you start getting paid. Sometimes this is several months and you need to make sure you understand exactly when and what you need to get paid. The US quarterly reporting season recently finished and Australian share market is right in the middle of it's end of year reporting season (Australian companies typically having a June year end). Every day 5 - 10 major companies are reporting their results and as an investor it is hard to know what to keep up with and whether you should be trading based on new information that is being released. For the most part, when you have invested in a company or are considering investing in a company you have done your research, you know what price the stock is worth and you know at what price you want to enter and exit at. Big price movements therefore work to your advantage if you can be disciplined and stick to your original plan. The hard thing about reporting season is that you have big price movements coupled with new information being released which adds much more complexity to the equation. The price may now be at the point you originally wanted to buy or sell at but you have all this new information that you need to process to see whether you should be re-evaluating your buy / sell point decision. The above situation is further complicated when you have a stock portfolio that contains multiple stocks. For example my stock portfolio contains 14 different stocks, 11 of which report in the same 4 week period. Many people have a much more diverse portfolio than I do. Imagine the situation with XYZ stock being repeated for every stock in your portfolio and you will see why many investors suffer information overload during reporting season and make bad decisions as a result. With bad news stories you need to assess how bad it actually is. Do you have any other rules that you use to get yourself through reporting season? Do you keep close track of your companies financials or do you prefer to set and forget? Whereas some of the previous sites that I have covered through my scam series could have just been businesses that were run badly (e.g. Publicity Monster) or businesses which did not accurately represent what their offering was (e.g. Collins & Kent International), there are some businesses out there that can be actually be bad for you and your business and you can do very little about it. This is the one thing that makes me think it is a scam. A quick mid-reporting season post from me on why you should listen to webcasts of results presentations during reporting season and how you should get them. During reporting season you are more than likely to be inundated with information from the companies that you have shareholdings in and ones you are looking to invest in. Later this week I will do a post on how to avoid making bad decisions when you are getting these constant flows of information. Most people that listen to the webcast of the management's presentations give up with 5 minutes because it sounds like a sales pitch. Worse they often just read out the presentation slides (which you could probably do yourself more quickly). However if you do this you are missing the most important part of the webcast. At the end of the management presentation (which usually takes about half an hour) they open up the floor to questions and the people that ask all the questions are the research analysts that cover the stock. This is some of the most valuable information that you can get! Given that most people outside the professional investment community do not have the access, time or inclination to receive and read all of the big investment banks broker research, the fact is that people do not know what they are following, what they think is important and sometimes miss the big issues facing the stock. However with the advent of webcasts (previously you had to have dial in details) you can hear EVERYTHING the research analysts asks and the management's response to it. You get to hear what they are asking (which is often more important than the answer itself). It is worth listening to the whole webcast for the Q&A session alone - it may take an hour of your time but if you come away with something you didn't know at the end of it about your investment which affects your investment decision then it is probably time well spent. Should you go guarantor for your children? Should you invest with family or friends? The initial phase of investing in your property is VERY time consuming and is likely to consume all of your investment time and almost all of your free time. After this process is all done therefore people feel like they should be doing more and should continue to be busy...this could not be further from the truth. After you have set everything up and everything is in place the key is to do close to nothing! It feels wrong - it feels like with the amount you have invested in this property that you need to keep doing things - there MUST be something else to do. In fact if everything is going to plan and you have set up everything correct you do not want to get a call from your property manager telling you that you need to do something. I have been dedicating one post a week to non- financial type posts (my weekend warrior series) and this week I thought I would do a post for all new bloggers out there. There is plenty of good information and tips on the Internet for new bloggers but I thought I would share some of mine. As a quick background this blog has been going for approximately 14 months now and is getting ~3000 - 4000 page views a month (as at August 2012). The blog originally grew very slowly as I only posted 5 - 10 times per month. In December 2011 I increased this to 5 times a week and in July 2012 increased it once again to 10 posts per week. I have found that the number of people reading and visiting my blog is exponentially related to how often the blog is updated. The hardest part about writing this many posts every week (as a sole contributor) is coming up with the topics. This post therefore will give you 5 tips to improve your topic generation process and should help you come up with posts much faster. This is a problem I had with a previous blog that I had started (Investor Book Review) which was dedicated exclusively to reviewing financial books. There was no way I could read and do insightful posts on even a weekly basis. Most of us would already have one (maybe two) credit card/s and the real question we have is whether we should sign up for another. There are plenty of benefits and cons to signing up for multiple credit cards and I have outlined a few below. I should note very early on that this, like so many other situations, is totally dependent on the individual and their financial circumstances and ability to control their impulses and debt. I think almost everyone would realise how much money they can save when buying books online rather than in store. The price difference is really astounding (the discount is often well above 50%) and the books are rarely out of stock (compared to going into your traditional book stores which actually have to physically stock the book. It is no surprise therefore that many book stores are going out of business. Book Depository was originally started as a UK site and it's big selling point was that it charged no shipping for customers ANYWHERE in the world. Even if the book was slightly more expensive on book depository you could save a lot of money on shipping. In 2011 Book Depository was acquired by Amazon but they kept the free shipping angle. This means that you get Amazon's great price, service and range but do not get charged shipping at all. For some reason the prices do differ between Amazon and Book Depository so it is always worth checking both sites (remembering to including the shipping charges on Amazon's site) to see which gives you the better deal. Fishpond is a site dedicated to Australians and New Zealanders who often pay the highest shipping charges from Amazon. Like Book Depository, Fishpond does not charge shipping fees to customers located in Australia or New Zealand. It is not Amazon however which means it's processes are not as good. Often I have found that their ordering system means that I've had to wait an extra 2 - 3 weeks for a book to arrive (but on the upside occasionally I'll get two books instead of just the one). One of best aspects of Fishpond which they do not advertise (but really should) is that if they have a book in their warehouse you can pay $0.50 extra and get it within 2 - 3 days. For Australian and NZ buyers this is almost unheard off as Book Depository and Amazon typically take a few weeks to deliver anything to Australia. They tend to keep a lot of popular titles in their warehouse and for a nominal amount more you can get it much quicker. I LOVE this aspect of Fishpond which is why they are normally my preferred site. I ALWAYS check the prices on all three sites before I buy. The prices vary a surprising amount between sites and you can really save quite a bit of money if you are an avid reader by going to all three before you buy. Do you know of any other good websites to buy books? Are there other country specific sites which you would like to share with people? Please post below if there are. Once you have gone through the business planning process and thought through the pros and cons of starting a business, and then this business and have a good idea of what your product is and who you are targeting - the next step is to choose your business name. This may sound rather easy but as I found out when setting up my own small business, you spend an awful lot of time trying to decide what it should be called. The fact is that although you can change it later down the track, as soon as you start operating you start building up goodwill in that business name and your customers will know you by that name from the start. The name therefore is rather important. It should have to do with your business in some way: This is not compulsory however if people can get a general idea from your business name what the business does then you are one step closer to getting them in the door and buying your product and service. Paypal is a great example of this. How much superannua​tion will I need when I retire? For all of us who live and work in Australia, the superannuation system provides a thought free way of providing for our retirement. Our employers are required to contribute a certain amount of our income (currently 9%, moving to 12%) to a retirement plan that will hopefully pay for our nest egg. Instead of working from how much you contribute today, expected rates of return and expected wage increases - all of which are VERY assumption dependent, the key is to work backwards from what you want when you retire. This is totally subjective and there is no right, wrong or unrealistic answer. If you want to live on a million dollars in today's money when you retire then you can work out what you need to do to get there. The fact is that you don't actually need that much per year in retirement. Calculate this at the point of your retirement (i.e. inflation adjust it until you're retirement age). For me that is 36 years away. I'm going to assume an inflation rate of 2.5% p.a. The future value of 6 million dollars looks HUGE. But don't forget that you are just working out how to achieve it. You are never going to get anywhere by paring back your expectations. Because superannuation is a government requirement of your employer - this is a savings number that you have no choice about. Thus it should be the first part of your calculation in how to get to your goal. Follow the steps below using your own numbers. Superannuation is currently 9% p.a. I am quite risk neutral so I will use 7.5% p.a. All goals are achievable - you just need to work out early what your plan of attack is and then let the power of compounding returns work over a long period of time. The fact is that you are at a major advantage if you are doing this planning process in your mid 20s compared to your late 40s so start early and retirement can be easy. As you would have seen from my collectible coin scam and questionable art investment with a guaranteed return post is that I actually quite enjoy busting what I think are questionable or downright dodgy business practices. When I was reading the newspaper last week I came across a journalist who looked like he had done the same thing. While I get 3000 - 4000 page views a month on this site (as at August 2012) this journalist wrote for Fairfax Media, one of the biggest publishing houses in Australia and the expose was therefore that much bigger. The company that was being called out for it's business practices was Publicity Monster, an Australian company which offers search engine optimisation (SEO) services to businesses in Australia. I will say up front that I have never had any dealings with this company - everything I write here I have sourced from information posted on the Internet by other providers and I will be linking to those sites. I do not know whether this company is a bad operator but I would recommend reading the independent reviews of them on the Internet before doing business with them. For a company that is all about publicity - Publicity Monster seems to be getting an awful lot of bad publicity. Actually I found it a little bit suspect that traditional 'ratings sites' such as True Local had either reviews with half a star or ones with five stars. I've never seen a discrepancy like that unless someone is playing games with the ratings site. Investing in the share market is all about opportunity costs (actually when it comes down to it - everything in life is about opportunity costs). Because we only have a finite amount of money we have to make a decision about which stocks to invest in if we want to obtain a superior return or whether to invest in index funds which mean that we will never outperform or under perform. This decision becomes much more complex once we start assessing whether or not to invest in the share market after all. The range of possibilities and the things you need to think about once you start considering whether your money would be better in the bank, in fixed interest securities, in non conventional investments (such as precious metals, collectible items etc) or whether you should just spend it on consumer items. Given the inherent uncertainties associated with almost all investment decisions when we get overloaded with choice we tend not to make any choice at all. This is most definitely not the best outcome for our financial well being. ...So what is the solution? The solution is not something new or innovative. It is something that people have been doing for hundreds of years. Once you have done this you no longer have the problem of deciding what class of assets you should invest in! The decision is already made by your plan. That is the beauty of this system. Invest a certain amount each month into certain categories of shares. This takes the splitting the investment money to next level. You allocate a certain amount that will be invested in defensive stocks, growth stocks, dividend stocks etc and then the decision becomes in this category what stocks do you want to invest in? I do not go to the level that point 2 suggests because I do not have the cash required to make cost effective purchases (in terms of trading costs - even with my cheap brokerage) on a monthly basis if I split the amount I am investing too far. I allocate a certain amount to shares and try and invest this regularly every month in a share which I think is showing good value. This is purely playing on small shareholders' dissatisfaction with the share price performance. Investing in real estate in some countries (such as Australia) are seen as the 'easiest' way to make money and so everyone clamours to get into the real estate market. However saving for a deposit is one of the hardest parts about entering the property market and so people who are looking to get on this supposed gravy train look to go with other people to get into the market quicker. Although there are some positives to investing with others, especially with family, in my opinion these are largely outweighed by the negative factors. I have listed both the pros and the cons of investing with family or friends and things you should consider before you invest. If you get sick or lose your job, your mortgage still has to be paid and your property still generates expenses. People always say 'this can't happen to me' and you often have a high degree of trust between yourself and family members or close friends but sometimes their inability to pay is not their fault - they may lose their job or have an accident. The bank does not care about this and they will come after you. When you own a property on your own you control everything including when maintenance gets done, when you sell, if and when you refinance. How do you split the profits / benefits if one person has contributed more than the other? What happens if you have an argument? We all want to make sure that the money we donate to charity gets used in the right way and actually gets to the people who need it the most. However if you do not research how much a charity actually spends on charitable work, a significant portion of your money could be going to administration costs to keep the charities' staff employed. Charities will typically provide (somewhere on their website or promotional material) a breakdown of how their funds are spent. You need to be comfortable with the level of their administration costs because even though they may have the most grand vision, if the money is not getting to the people they want to help then it is not doing any good. Where can I find the expense breakdown? Note that I would avoid sites that charge charities for a 'premium listing' but do little to provide the donors with information about the charity - in particular those that do little to describe and evaluate what the charity does and it's openness. What should I look out for in the expense breakdown? This post will deal with the difference between ESG (which stands for Environmental, Social and Governance) and ethical investing. They are actually very separate ideas although people tend to use them interchangeably. If you are particularly concerned about ESG and are looking for a fund that invests using ESG principles have a look at the language in their documentation to see where on the scale they are. Some funds are primarily value funds who see the downside for firms not investing in ESG principles while others truly believe that investing in ESG conscious firms will result in higher long run returns. Ethical investing, quite simply is investing only in those companies which meet a strict criteria for investment. It is often considered a 'negative screen' because there is a very definite idea of what sort of companies should not be included. What is the difference between ESG Investing and Ethical Investing? The Big Short by Michael Lewis, author of Liar’s Poker, is a well researched, although obviously biased, look at sub-prime debt crisis and the factors that led up to it. The book has been on several best sellers lists and for good reason – it is the best book that I have read on the topic and is interesting even if you do not know anything about CDO’s, subprime debt, the US housing market and all the other factors that led to the crisis. Although the book primarily focuses on the hedge funds (including a fund that was seeded by Joel Greenblatt, author of You Can Be a Stock Market Genius which was been previously reviewed on this site) that saw the crisis coming and made significant money out of it, Lewis also looks at the other players in the market including the buyers of the mortgage backed securities, the buyers of the credit default instruments, the investment banks that were pedalling the goods to everyone and the ratings agencies who were probably the reason that the whole thing came undone. As a last point of note, when I read this book I read it from the perspective of an investor (as that is what I do for a living). However I was chatting about it to investment bankers who really focussed on the failings of their business model and incentives. Again when chatting about it to those who have nothing to do with the financial industry the focus was on how the system failed. There are so many different ways to interpret the lessons from this book and it all depends on the perspective you are reading it from.